Follow our step-by-step, photo illustrated recipe to make this tender, and mouth watering, pork loin roast recipe. We’ll even show you how to turn the pan drippings into some great gravy to serve along with the roast. Printable recipe included. Pork Roast with Gravy Recipe. 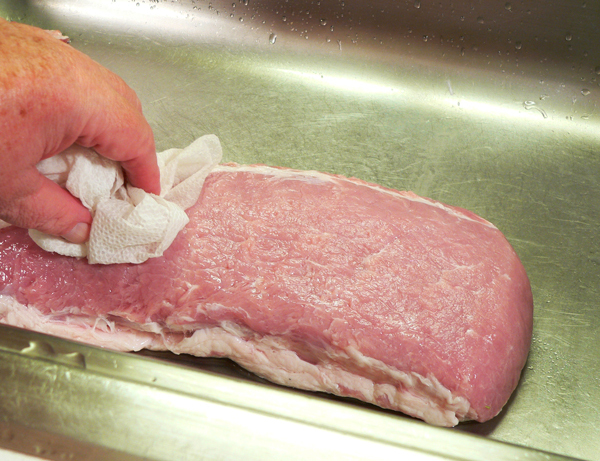 Pork Roast may be one of those cuts of meat that you’ve shied away from in the grocery store. But, it shouldn’t be. There are lots of delicious ways to prepare it, and I think you’ll find this a great way to get started. First, let’s not get confused between a Pork Loin Roast and a Pork Tenderloin. They are two entirely different cuts of meat. Both are delicious though. 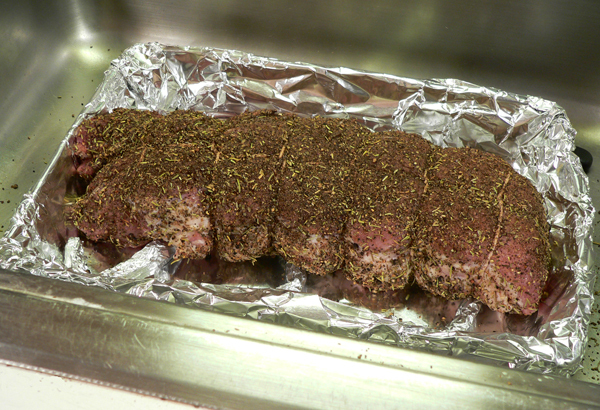 We’re using a Boneless Pork Loin Roast for this recipe. 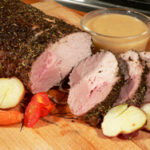 A pork roast will typically be between two and five pounds in size, while a Pork Tenderloin cut is usually around a pound in size. Both are sold whole, but the Pork Loin Roast can often be cut down into smaller pieces which is what sometimes causes the confusion. 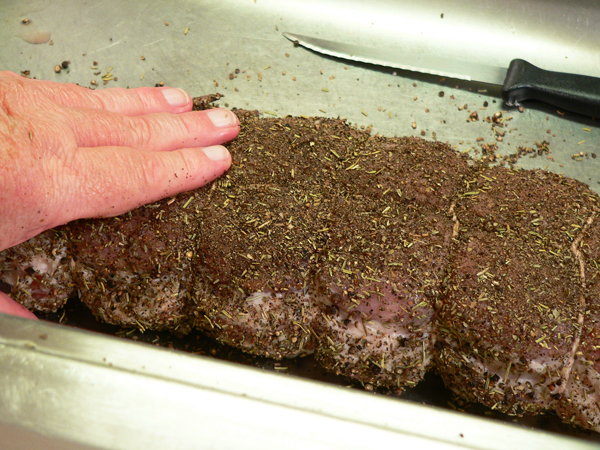 Pork Roasts are often stuffed and cooked, or as in this case, rubbed with spices and then cooked. I love a good Pork Tenderloin Biscuit. Around here, I can generally find a restaurant that serves them for breakfast. It’s just tenderloin that has been cooked and sliced with a couple of small slices placed inside a hot buttermilk biscuit. Add a little Duke’s Mayonnaise, and I’m happy. 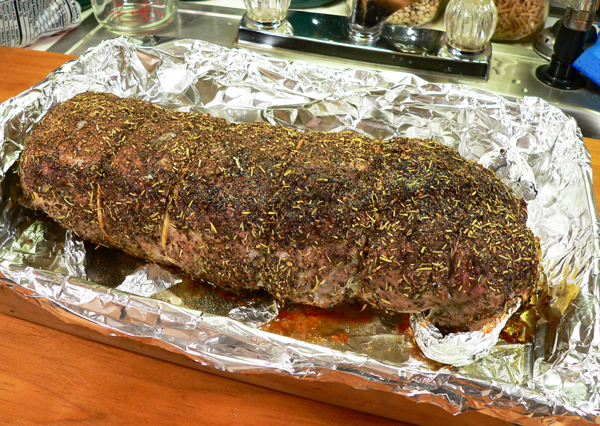 But, we’ll save the tenderloin recipe for later, today, we’re talking about Pork Roast. 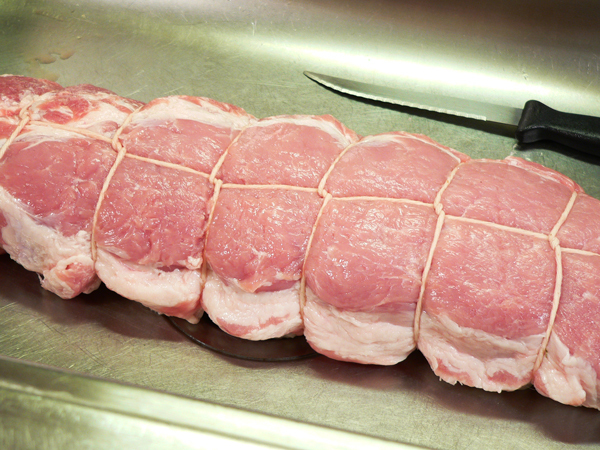 Pork Loin comes from the area of the pig between the shoulder and the beginning of the leg. It can be sold bone-in, or as we have here… boneless. While it’s really best on the grill in my opinion, I find it is still very tasty and delicious when properly roasted in the oven. I’ve got a simple rub that we coat the roast in, then cook it for about 20 minutes per pound. I’ll even show you how to make some delicious gravy to serve along with it if you’re having it for Sunday dinner, or just supper with the family. It’s totally awesome simply sliced and placed in a bun, or between a couple of slices of white sandwich bread. Just don’t forget to add the Duke’s Mayonnaise. It’s a Southern thing. If you’ve been passing the pork loin roast in your grocery store and never bought one, now is the time to correct that. You’ll find this recipe very easy, with great results. You can just thank me later. Smile. Ready to give it a try? Alright then, let’s get in the kitchen, mix up a rub, and… Let’s Get Cooking! 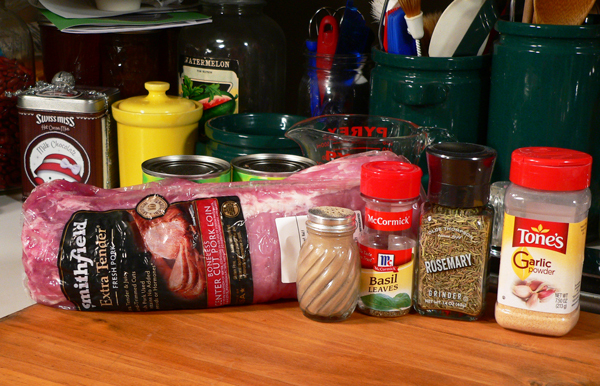 Boneless Pork Loin Roast recipe: You’ll need these ingredients. Remove the roast from the packaging. This is about a 4 1/2lb boneless pork loin roast. Gently rinse the roast under cold running water. There’s very little fat attached to this roast, so I’m going to leave it all on. Tie the roast with kitchen twine if desired. While it’s not necessary that you tie the roast, doing so will help it hold its shape during the cooking process. I’m not showing you how this is done because it takes two hands, and it would be difficult to take photos of the process at the same time. I suggest you search for some of the videos that are available online for better instructions on how to tie your roast than I could provide here. It’s pretty simple to do and I think you’ll like the presentation of it all if you take the time to add this step. Place all the spices together in a small mixing bowl and mix well. Rub a generous coating of the spice rub all over the roast. Pat it into the meat to help it stay on. 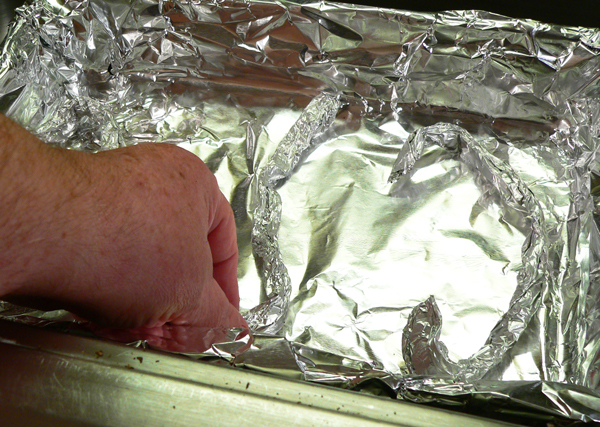 If you don’t have a roasting pan with a rack, just roll up several pieces of aluminum foil like this. Place the rolled up foil inside a foil lined baking dish or pan. I’m using a 13x9x2 metal pan that I’ve lined with aluminum foil. Then, I placed the rolled up foil inside the pan, shaping as needed. This will support the roast and keep it from sitting directly on the bottom of the pan while it roasts. This way, it’s not sitting in juices as it cooks. 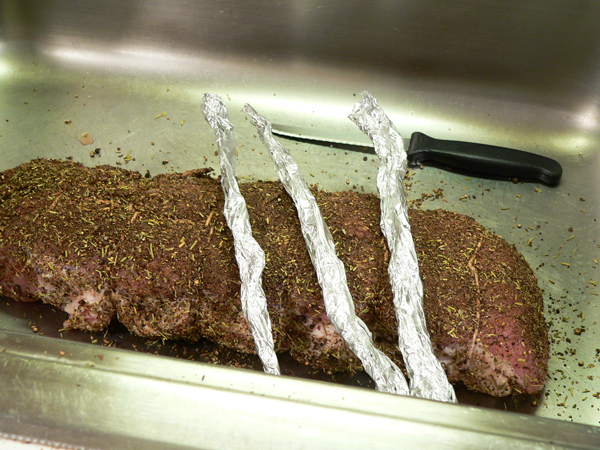 Place the roast on top of the rolled up pieces of foil. If you DO have a regular roasting pan with a wire rack, just place the roast on the rack. It will work just as well either way. The roast needs to be about room temperature before you place it in the oven. I let this one set out for about an hour after I added the rub, then I placed it in the oven. Place the roast inside the oven, which has been pre-heated to 350F degrees. The roast will need to bake for about 20 minutes per pound, or until the meat reaches an internal temperature of 145F degrees. Bake the roast until it reaches an internal temperature of 145F degrees. 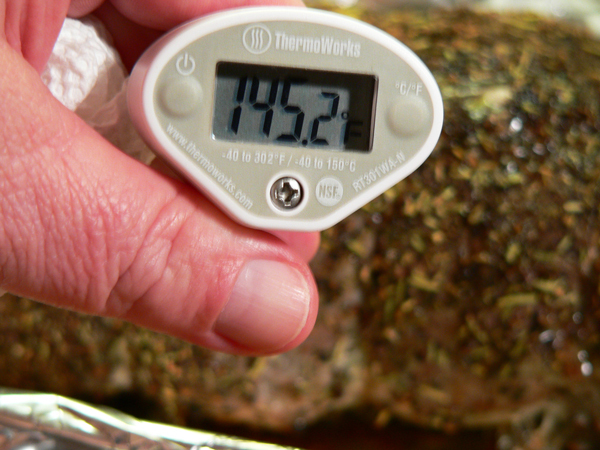 I say it all the time, a digital thermometer is one of the best tools you can have in your kitchen. Just be sure to check the temperature of the roast at several points, from one end to the other, as the temperature may vary from one side to the other in your oven. Make sure each temperature reading is at least at the 145F degree mark to be certain it’s fully cooked. 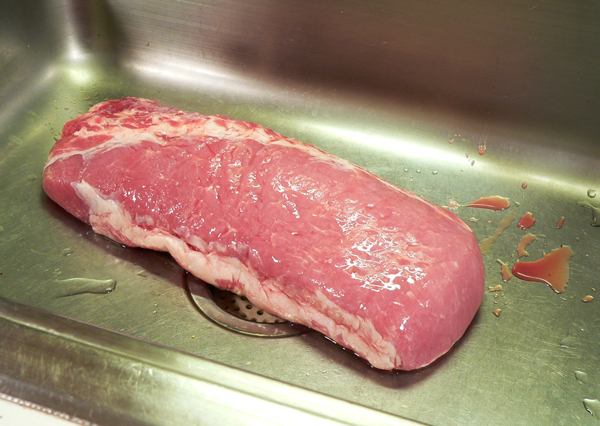 Remove the roast from the oven when done, and just let it rest on your counter top for 10 minutes before slicing. Letting it rest for this short period of time lets the juices redistribute throughout the meat. While it’s resting, we can go ahead and make our gravy. Place a medium sized sauce pot over Medium Heat on your stove top. Add about 3 Tablespoons of Butter, or about 3 Tablespoons of drippings from your meat pan. My roast had very little juice and drippings. I scrapped out some of the brown bits from the bottom of the pan, and then added a couple of Tablespoons of butter to equal out about 3 Tablespoons of fat in order to make the pork gravy. 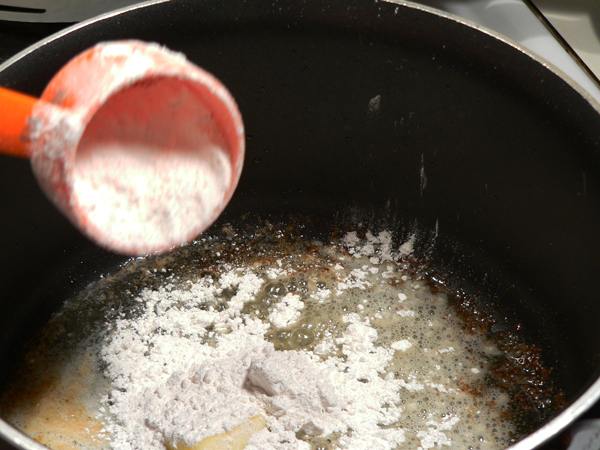 Let the butter fully melt, then sprinkle 3 Tablespoons of flour on top of the melted fat. You will always want to work with equal parts of fat and flour when making gravy. This part is called making a roux. 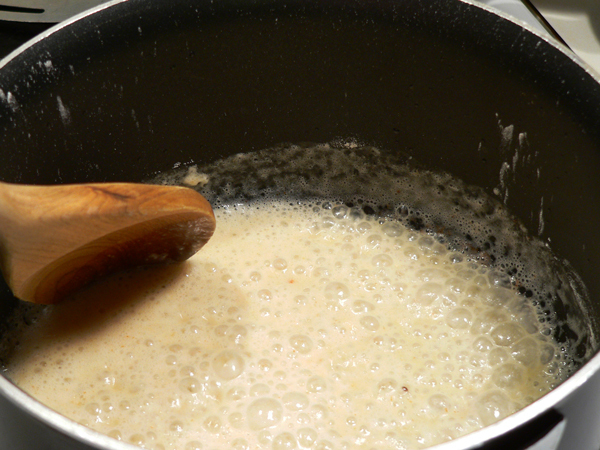 Stir the butter/fat and the flour together constantly to make the roux. Don’t let this mixture get too hot, but do let it cook for a minute or two, stirring constantly. You want to cook out the taste of raw flour and let the roux darken and brown a bit. Continue to stir as you gradually add in the broth. A wooden spoon works well but so does a whisk. Just keep stirring quickly and constantly to stir away any lumps that might start to form. I’m using regular chicken broth, but you can also find “ham base” in cubes or granules that will give it more of a pork flavor. Continue to stir and cook the gravy until it begins to thicken. 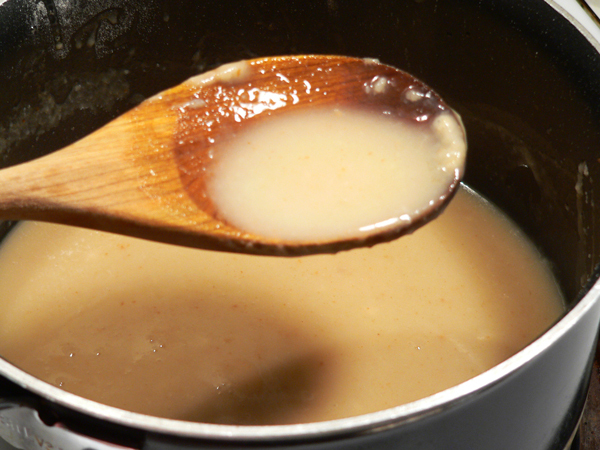 Constant stirring will decrease any lumps that might try to form while making gravy. Once you “get the hang of it” gravy making becomes much easier. Still, you can always run your gravy through a strainer to remove any lumps if you need too. It happens to all of us. Slice it while it’s still warm and… ENJOY! Place a couple of pieces on a plate and top it with some warm gravy. Serve it with some of your favorite sides and you’ve got a great meal for any time of the day. And you should know me well enough by now to know that this makes a great sandwich as well. Especially with a little Duke’s Mayonnaise and a couple of slices of plain white bread. Now that’s just good eating. Smile. 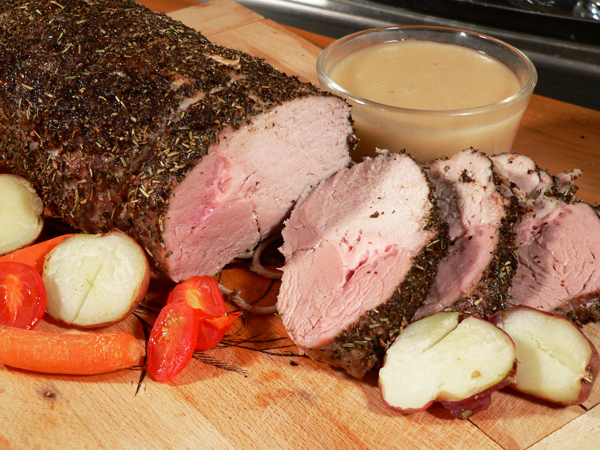 Follow our step-by-step, photo illustrated recipe to make this tender, and mouth watering, pork loin roast recipe. 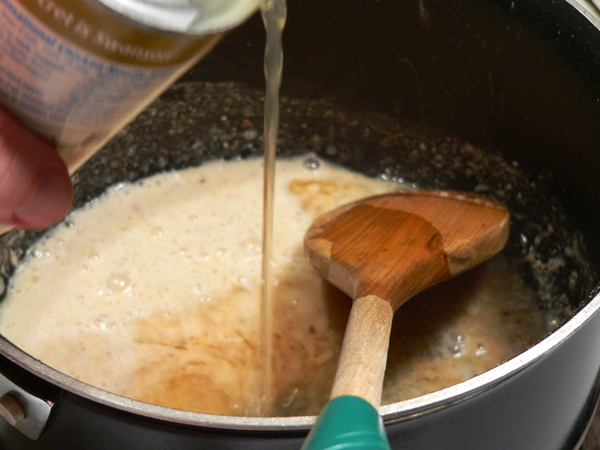 We’ll even show you how to turn the pan drippings into some great gravy to serve along with the roast. 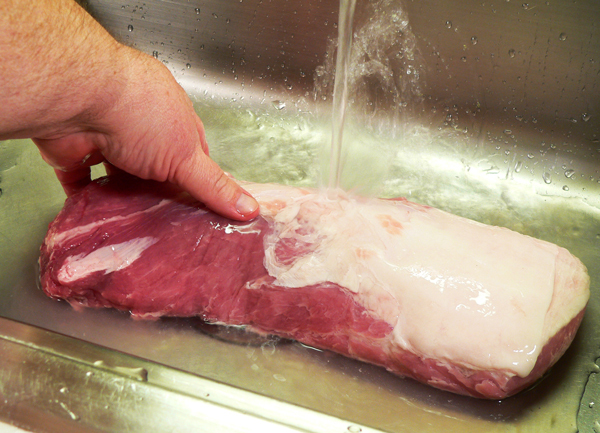 Lightly rinse the pork roast under cool running water. If desired, tie the roast with kitchen twine. In a small mixing bowl, add all the spices, stir well to create a rub. Rub the spice mixture over all the pork roast. Let the roast sit for one hour prior to placing in the oven. Place the roast in a shallow pan, preferably on a wire rack. Place the roast in a 350F degree oven. Bake 1 hour (20 minutes per pound) or until internal temp reaches 145F degrees. Remove from oven, let rest at least 10 minutes before slicing. Pour pan drippings into a glass measuring cup. Let stand until the fat floats to the top of the cup. Skim 3 Tablespoons of fat from the top of the cup. 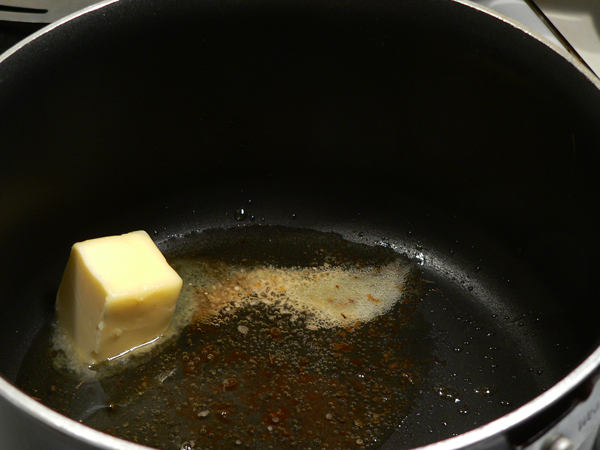 Place the fat in a skillet, over medium heat, on your stove top, or add 3 Tablespoons Butter if needed. Sprinkle in 3 Tablespoons of All-Purpose Flour. Cook and stir, over medium heat, for 1 to 2 minutes, until browned. Add 1 cup of pork or chicken broth to the leftover pan drippings. Stir to combine. Add the liquid to the skillet, stirring quickly to remove any lumps. Continue to stir and cook until the gravy is smooth and has thickened as desired. Serve over pork roast slices. This would be great on the grill. Your Comments: Have you ever cooked a boneless pork loin roast? I’d love to hear your thoughts on our recipe. It will only take a minute or two for you to leave your comments in the section below. Good Tuesday Morning to you, yes I have cooked many boneless pork roasts, in the oven, on a rotisserie grill over hickory chips, in the crock pot. I make Bar B Que out of it with home made eastern and western style sauce, pot roasts with potatoes, carrots and onions, and just plain good old roast. But I have never made gravy with it before, good to have a recipe for making the gravy. I know my family would love that with mashed potatoes. And in response to last weeks question, I make a great spaghetti sauce too. Secret is using Neese’s sausage as the ground meat, and green olives in the sauce. Use tomato sauce WITHOUT SALT ADDED, the sausage is salty enough, tomato paste, dash of sugar to cut the acid, oregano, garlic powder, basil. My mom used to put cheddar cheese in the sauce too, I do that once in a while also. My family loves it. Happy fishing! Looks delicious! I just made some balsamic onion jam that would be great with this roast pork.